The rule of the Chalukyas marks an important milestone in the history of South India and a golden age in the history of Karnataka. The political atmosphere in South India shifted from smaller kingdoms to large empires with the ascendancy of Badami Chalukyas. A Southern India-based kingdom took control and consolidated the entire region between the Kaveri and the Narmada rivers. The rise of this empire saw the birth of efficient administration, overseas trade and commerce and the development of new style of architecture called "Chalukyan architecture". Kannada literature, which had enjoyed royal support in the 9th century Rashtrakuta court found eager patronage from the Western Chalukyas in the Jain and Veerashaiva traditions. The 11th century saw the birth of Telugu literature under the patronage of the Eastern Chalukyas. Chalukya emblem of Aihole in Karnataka depicts Vishnu in Varaha form. A 6th century stone emblem. While opinions vary regarding the early origins of the Chalukyas, the consensus among noted historians such as John Keay, D.C. Sircar, Hans Raj, S. Sen, Kamath and Karmarkar is the founders of the empire at Badami were native to the modern Karnataka region. A later record of Eastern Chalukyas mentions the northern origin theory and claims one ruler of Ayodhya came south, defeated the Pallavas and married a Pallava princess. She had a child called Vijayaditya who is claimed to be the Pulakeshin I's father. However, according to the historians K. V. Ramesh, Chopra and Sastri, there are Badami Chalukya inscriptions that confirm Jayasimha was Pulakeshin I's grandfather and Ranaranga, his father. Kamath and Moraes claim it was a popular practice in the 11th century to link South Indian royal family lineage to a Northern kingdom. The Badami Chalukya records themselves are silent with regards to the Ayodhya origin. 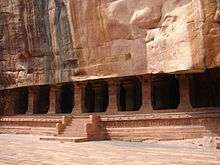 Inscriptions in Sanskrit and Kannada are the main source of information about the Badami Chalukya history. Among them, the Badami cave inscriptions of Mangalesha (578), Kappe Arabhatta record of c. 700, Peddavaduguru inscription of Pulakeshin II, the Kanchi Kailasanatha Temple inscription and Pattadakal Virupaksha Temple inscription of Vikramaditya II (all in Kannada language) provide more evidence of the Chalukya language. The Badami cliff inscription of Pulakeshin I (543), the Mahakuta Pillar inscription of Mangalesha (595) and the Aihole inscription of Pulakeshin II (634) are examples of important Sanskrit inscriptions written in old Kannada script. The reign of the Chalukyas saw the arrival of Kannada as the predominant language of inscriptions along with Sanskrit, in areas of the Indian peninsula outside what is known as Tamilaham (Tamil country). Several coins of the Badami Chalukyas with Kannada legends have been found. All this indicates that Kannada language flourished during this period. Travelogues of contemporary foreign travellers have provided useful information about the Chalukyan empire. The Chinese traveller Xuanzang had visited the court of Pulakeshin II. At the time of this visit, as mentioned in the Aihole record, Pulakeshin II had divided his empire into three Maharashtrakas or great provinces comprising 99,000 villages each. This empire possibly covered present day Karnataka, Maharashtra and coastal Konkan. Xuanzang, impressed with the governance of the empire observed that the benefits of king's efficient administration was felt far and wide. Later, Persian emperor Khosrau II exchanged ambassadors with Pulakeshin II. "Once when Brahma, the creator, was engaged in the performance of the sandhya (twilight) rituals, Indra approaced and beseeched him to create a hero who could put to an end the increasing evil on earth. On being thus requested, Brahma looked steadily into the Chuluka-jala (the water of oblation in his palm) and out sprang thence a great warrior, the progenitor of the Chalukyas". The Chalukyas claimed to have been nursed by the Sapta Matrikas ("seven divine mothers") and were worshippers of many gods including Siva, Vishnu, Chamundi, Surya, Kubera, Parvati, Vinayaka and Kartikeya. Some scholars connect the Chalukyas with the Solankis of Gujarat. According to a myth mentioned in latter manuscripts of Prithviraj Raso, Solankis were born out of fire-pit (Agnikund) at Mount Abu. However it has been reported that the story of Agnikula is not mentioned at all in the original version of the Prithviraj Raso preserved in the Fort Library at Bikaner. 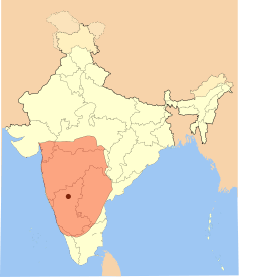 In the 6th century, with the decline of the Gupta dynasty and their immediate successors in northern India, major changes began to happen in the area south of the Vindyas – the Deccan and Tamilaham. The age of small kingdoms had given way to large empires in this region. The Chalukya dynasty was established by Pulakeshin I in 543. Pulakeshin I took Vatapi (modern Badami in Bagalkot district, Karnataka) under his control and made it his capital. Pulakeshin I and his descendants are referred to as "Chalukyas of Badami". They ruled over an empire that comprised the entire state of Karnataka and most of Andhra Pradesh in the Deccan. Pulakeshin II, whose precoronation name was Ereya, commanded control over the entire Deccan and is perhaps the most well-known emperor of the Badami dynasty. He is considered one of the notable kings in Indian history. His queens were princess from the Alupa Dynasty of South Canara and the Western Ganga Dynasty of Talakad, clans with whom the Chalukyas maintained close family and marital relationships. Pulakeshin II extended the Chalukya Empire up to the northern extents of the Pallava kingdom and halted the southward march of Harsha by defeating him on the banks of the river Narmada. He then defeated the Vishnukundins in the southeastern Deccan. 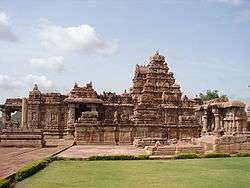 Pallava Narasimhavarman however reversed this victory in 642 by attacking and occupying Badami temporarily. It is presumed Pulakeshin II, "the great hero", died fighting. After the decline of the Badami Chalukya empire in the mid-8th century, territorial disputes flared up between the Rashtrakutas, the new rulers of the western deccan, and the Eastern Chalukyas. For much of the next two centuries, the Eastern Chalukyas had to accept subordination towards the Rashtrakutas. Apart from a rare military success, such as the one by Vijayaditya II(c.808-847), it was only during the rule of Bhima I (c.892-921) that these Chalukyas were able to celebrate a measure of independence. After the death of Bhima I, the Andhra region once again saw succession disputes and interference in Vengi affairs by the Rashtrakutas. The fortunes of the Eastern Chalukyas took a turn around 1000. Danarnava, their king, was killed in battle in 973 by the Telugu Choda King Bhima who then imposed his rule over the region for twenty-seven years. During this time, Danarnava's two sons took refuge in the Chola kingdom. Choda Bhima 's invasion of Tondaimandalam, a Chola territory, and his subsequent death on the battlefield opened up a new era in Chola–Chalukya relations. Saktivarman I, the elder son of Danarnava was crowned as the ruler of Vengi in 1000, though under the control of king Rajaraja Chola I. This new relationship between the Cholas and the coastal Andhra kingdom was unacceptable to the Western Chalukyas, who had by then replaced the Rashtrakutas as the main power in the western Deccan. The Western Chalukyas sought to brook the growing Chola influence in the Vengi region but were unsuccessful. The Badami Chalukya era was an important period in the development of South Indian architecture. Their style of architecture is called "Chalukyan architecture" or "Karnata Dravida architecture". Nearly a hundred monuments built by them, rock cut (cave) and structural, are found in the Malaprabha river basin in modern Bagalkot district of northern Karnataka. 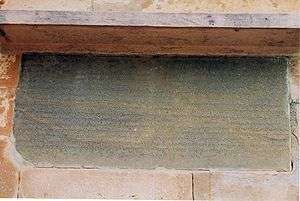 The building material they used was a reddish-golden Sandstone found locally. 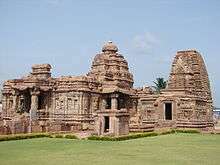 Though they ruled a vast empire, the Chalukyan workshops concentrated most of their temple building activity in a relatively small area within the Chalukyan heartland – Aihole, Badami, Pattadakal and Mahakuta in modern Karnataka state. The Aihole inscription of Pulakeshin II (634) written by his court poet Ravikirti in Sanskrit language and Kannada script is considered as an classical piece of poetry. A few verses of a poet named Vijayanaka who describes herself as the "dark Sarasvati" have been preserved. It is possible that she may have been a queen of prince Chandraditya (a son of Pulakeshin II). Famous writers in Sanskrit from the Western Chalukya period are Vijnaneshwara who achieved fame by writing Mitakshara, a book on Hindu law, and King Someshvara III, a noted scholar, who compiled an encyclopedia of all arts and sciences called Manasollasa. Both Shaivism and Vaishnavism flourished during the Badami Chalukya period, though it seems the former was more popular. Famous temples were built in places such as Pattadakal, Aihole and Mahakuta, and priests (archakas) were invited from northern India. Vedic sacrifices, religious vows (vrata) and the giving of gifts (dana) was important. The Badami kings were initially followers of Vedic Hinduism and dedicated temples to popular Hindu deities in Aihole. Sculptures of deities testify to the popularity of Hindu Gods such as Vishnu, Shiva, Kartikeya, Ganapathi, Shakti, Surya and Sapta Matrikas ("seven mothers"). The Badami kings also performed the Ashwamedha ("horse sacrifice"). The worship of Lajja Gauri, a fertility goddess is known. Jainism too was a prominent religion during this period. The kings of the dynasty were however secular and actively encouraged Jainism. One of the Badami Cave temples is dedicated to the Jain faith. Jain temples were also erected in the Aihole complex, the temple at Maguti being one such example. Ravikirti, the court poet of Pulakeshin II was a Jain. 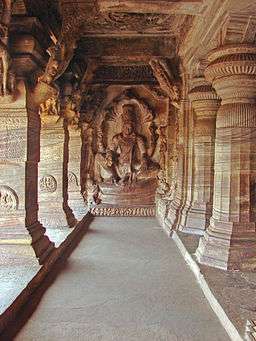 Queen Vinayavati consecrated a temple for the Trimurti ("Hindu trinity") at Badami. Sculptures of the Trimurti, Harihara (half Vishnu, half Shiva) and Ardhanarishwara (half Shiva, half woman) provide ample evidence of their tolerance. Buddhism was on a decline, having made its ingress into Southeast Asia. This is confirmed by the writings of Hiuen-Tsiang. Badami, Aihole, Kurtukoti and Puligere (modern Lakshmeshwar in the Gadag district) were primary places of learning. A celebration called Chalukya utsava, a three-day festival of music and dance, organised by the Government of Karnataka, is held every year at Pattadakal, Badami and Aihole. The event is a celebration of the achievements of the Chalukyas in the realm of art, craft, music and dance. The program, which starts at Pattadakal and ends in Aihole, is inaugurated by the Chief Minister of Karnataka. Singers, dancers, poets and other artists from all over the country take part in this event. In the 26 February 2006 celebration, 400 art troupes took part in the festivities. Colorful cut outs of the Varaha the Chalukya emblem, Satyashraya Pulakeshin (Pulakeshin II), famous sculptural masterpieces such as Durga, Mahishasuramardhini (Durga killing demon Mahishasura) were present everywhere. 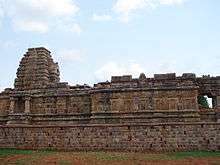 The program at Pattadakal is named Anivaritacharigund vedike after the famous architect of the Virupaksha temple, Gundan Anivaritachari. 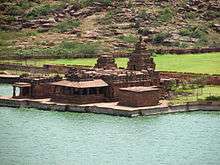 At Badami it is called Chalukya Vijayambika Vedike and at Aihole, Ravikirti Vedike after the famous poet and minister (Ravikirti) in the court of Pulakeshin II. Immadi Pulakeshi, a Kannada movie of the 1960s starring Dr. Rajkumar celebrates the life and times of the great king. ↑ Azmathulla Shariff. "Badami Chalukyans' magical transformation". Deccan Herald, Spectrum, July 26, 2005. Archived from the original on 2007-02-10. Retrieved 2006-11-10. ↑ Carol Radcliffe Bolon. "The Mahakuta Pillar and Its Temples". Artibus Asiae publishers, Vol. 41, No. 2/3 (1979), pp. 253–268. Retrieved 2006-11-10. ↑ Sen, Sailendra (2013). A Textbook of Medieval Indian History. Primus Books. p. 28. ISBN 978-9-38060-734-4. ↑ S.R. Bakshi; S.G (2005). Early Aryans to Swaraj. p. 325. ISBN 978-81-7625-537-0. It has been reported that the story of agnikula is mot mentioned at all in the original version of the Raso preserved in the Fort Library at Bikaner. ↑ The Eastern Chalukya inscriptions show a gradual shift towards Telugu with the appearance of Telugu stanzas from the time of king Gunaga Vijayaditya (Vijayaditya III) in the middle of the 9th century, Dr. K.S.S. Seshan, University of Hyderabad. "APOnline-History of Andhra Pradesh-ancient period-Eastern Chalukyas". Revenue Department (Gazetteers), Government of Andhra Pradesh. Tata Consultancy Services. Retrieved 2006-11-12. ↑ Govindaraya Prabhu, S (November 1, 2001). "The Southern India: Coinage of the Chalukyas". Prabhu's Web Page On Indian Coinage. Archived from the original on 2008-12-01. Retrieved 2008-08-06. 1 2 Staff correspondent. "Chalukya Utsava: Depiction of grandeur and glory". NewIndia Press, Sunday February 26, 2006. NewIndia Press. Retrieved 2006-11-12. Ramesh, K.V. (1984). Chalukyas of Vatapi. Delhi: Agam Kala Prakashan. 3987-10333. "The Mahakuta Pillar and Its Temples, Carol Radcliffe Bolon, Artibus Asiae publishers, Vol. 41, No. 2/3 (1979), pp. 253–268". Retrieved 2006-11-10. "APOnline – History of Andhra Pradesh-ancient period-Eastern Chalukyas by Tata Consultancy Services". Retrieved 2006-11-12. "Architecture of Indian Subcontinent, Takeyo Kamiya, 20 September 1996, Published by Gerard da Cunha-Architecture Autonomous, Bardez, Goa, India". Retrieved 2006-11-12. "Badami Chalukyans' magical transformation, an article by Azmathulla Shariff in Deccan Herald, Spectrum, 26 July 2005". Archived from the original on 2007-02-10. Retrieved 2006-11-12. "Chalukyan Art by Dr. Jyotsna Kamat, Kamat's Potpourri, 4 November 2006". Retrieved 2006-11-10. "History of the Kannada Literature, Dr. Jyotsna Kamat, on Kamat's Potpourri, Timeless Theater-Karnataka-History of Kannada, 4 November 2006". Retrieved 2006-11-12. "Aihole Temples, Photographs by Michael D. Gunther, 2002". Retrieved 2006-11-10. "Badami Cave Temples, Photographs by Michael D. Gunther, 2002". Retrieved 2006-11-10. "Pattadakal Temples, Photographs by Michael D. Gunther, 2002". Retrieved 2006-11-10. "Coins of Alupas". Archived from the original on 2006-08-15. Retrieved 2006-11-10.